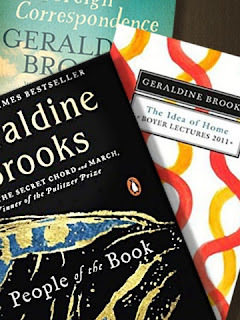 THE PEOPLE OF THE BOOK by Geraldine Brooks did not deal with the Word of God, but it definitely dealt with His people. The inspiration for this book, the Sarajevo Haggadah is the pride and glory of the Bosnian museum collection. Its history was so unique - it was spared during the Spanish Inquisition, and the Nazi’s book burning in World War II. It was spirited out of the library and hidden in a bank vault when the Serbs started bombing the libraries and museums of Sarajevo during the Bosnian War (1992-1995). It was written and illustrated in Spain during the mid 14th century. Carried and ferried by people whose main motive was the survival of a culture. Let’s get on with the hard parts first. Geraldine Brooks was a journalist, and her penchant for the vast historical background was very evident here. There were mysteries involved and some really interesting twist and turns. But wherein a historical fiction should have a smooth buttery beginning so it can sink in more easily, the first 100 pages (or so) was actually a trial for me. The prose was readable but lacks the drive to move the reader emotionally. The characterization was supposedly the vital part of the story. Unfortunately, there was no space for humor, no play of language, or color of emotions for me. I believe that for a historical novel to survive within its pages, the reader must have a chance to attach him/herself to the characters. There must be a psychological or emotional impact that may manipulate individuality to bring the past into life. What then made me read on? There were three. (1) What it lacked in prose and character, its rich history made up for it. Ms. Brooks undeniably knows her history. Curiosity kept it alive for me; there was a need for me to simply follow it. Each clue that Hannah Heath found, takes us further and further in time. It was like walking backwards, until the present finally caught up. Such astounding revelations. (2) Art was the other thing. The book explored how people all throughout history used the creation of objects and paintings to record events, express their beliefs, and show how they respond to them. It gave credence to the religious communities that had been recording their history with passion. At the latter part of the book, it tackled the research and preservation of the Aboriginal rock art as a record of a unique ancient culture in Australia. (3) There were issues about survival all throughout the novel. It tackled the survival of the people and the haggadah in the state of armed conflict, in the presence of religious persecution, and deceit. “...the haggadah came to Sarajevo for a reason. It was here to test us, to see if there were people who could see that what united us was more than what divided us. That to be a human being matters more than to be a Jew or a Muslim, Catholic or Orthodox." In the fewest possible words, The People of the Book is about history, art, and survival that empowered and renewed the people. Ms. Brooks's fictional history of the Sarajevo Haggadah is curiously inspiring indeed.